The Toronto real estate market is a complex arena that has some investors running from the city. Some officials have pointed to the increase in construction in the Greater Toronto Area (GTA) and the prevalence of condominium investors who are expecting to flip the properties when they are finished. There has been some slowing in new purchases while foreign investors are starting to back away. This does not mean that the real estate market in Toronto is headed for disaster. There are several reasons why it is still safe to invest in real estate in the city. The fear of a bubble is founded on the belief that interest rates are going to increase dramatically, or that unemployment will suddenly surge. This will cause Torontonians to lose money and to then fall behind on payments. The bubble bursts when homes are lost throughout the GTA. These houses will then create a massive supply of real estate that will lower property values, dilute the market and result in a collapse of the housing industry. These events will probably not come to pass any time soon. Interest rates have not increased significantly in years and are expected to go up only modestly if at all in the coming years. Some predict less than 1 percent. Additionally, the problems that are described would not result in a sharp contraction but rather a slow decline that could be stopped or mitigated in any number of ways including new home sales to foreign investors and new residents. 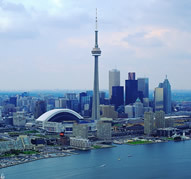 It has been stated that the houses and condos in Toronto are overvalued by as much as 25 percent. This has resulted in some officials who are threatening to perform a massive adjustment in order to bring prices in line with what is perceived to be market values. While there is some truth to the statements about overvaluation of property, the idea of an adjustment is at least several years away if it ever occurs. It is more likely that a slow and fairly minor contraction or changes in demographics in the area will allow the market to naturally find the correct levels. Many investors in Toronto point out that the seller’s market is gone and the real estate scene is now balanced. Foreign money that comes in for the purchase of new condos is still coming in. The GTA sees significant population growth every single year. There is enough demand in the Toronto real estate market to cover the supply of current properties and those that are being constructed. New construction permits dropped by a few percent so that there will be a lower supply in the coming years. It is also clear that there is a huge demand for properties that are directly in downtown Toronto. This demand is driven by young people, new residents and retirees who have no desire to live outside of the downtown area. The Toronto real estate market might be in flux, but there is still no evidence that any of the financial fears that are commonly stated will come to pass in the near future. This means that it is still safe to invest in real estate in Toronto.